Kitsune's namesake is the red fox of Hokkaido. The mythological spirit fox has magical powers and is a shapeshifter who morphs into beautiful women, young girls, and elderly men. Kitsune Restaurant and Pub focuses on Midwestern bounty, influenced by home-style Japanese cuisine. The menus change with the seasons and are intentionally focused on the purity of ingredients of our local farmers. We are not a Japanese restaurant aiming for the label of authentic, traditional, or modern "fusion." We simply incorporate fundamental techniques, flavor profiles, Japanese culinary philosophies, and comfort into our menus. We are not to be over-thought, yet our goal is to make you think. The basis of our mission begins with sustainable cuisine, dedicated to earth consciousness, and expands from there. We use nearly all of our ingredients in their entirety from root to leaf and head to tail. Come in. Relax. Eat. Drink. Indulge. Walk-ins Welcome. And if you walk in before 6:00 there may very well not be a wait. Now selling kits for May-July! Ramen for 2 ready for pick up every Saturday for a month. Each Saturday swing by between noon and 4pm to pick up a completely different kit. Choose between May, June or Julyl. Or go for all three. Who are we to judge? Each kit will require some light assembly, but full instructions will be provided. They will include fresh seasonal ingredients. Your kit will have a shelf life of up to 5 days. Ramen kits are a monthly subscription service. The $120 dollar flat rate price includes 4 meals for 2 people. No extra taxes, fees, or charges. No long term commitments. Please understand that since we'll also be busy getting Bunny Bakery and Workshop up and running, we unfortunately are unable to accommodate dietary restrictions this time around. 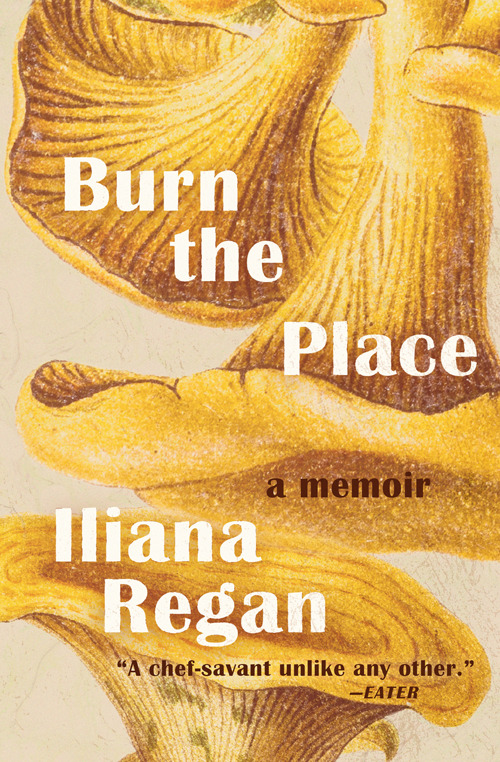 Pre-order a copy of Burn the Place. All copies purchased through this link will be signed! A memoir of Chef Regan’s life! Mushrooms, magic, fun, debauchery, food, love, jail, disasters, and triumphs. What a relief, then, to land at 24-seat Kitsune, far from the Loop, in North Center. This is the idiosyncratic restaurant of chef Iliana Regan, who became a champion of midwestern foraging and terroir at her first restaurant, Elizabeth. Here she applies those principles to Japanese cooking: delicate, wobbly chawanmushi swimming with bits of clam, marinated roe, and bacon; or ramen noodles made with ramps. This isn't gimmicky, or even particularly visible, “fusion,” but quiet, careful, nourishing invention. At Elizabeth, her lauded first restaurant, Regan gained notoriety for her devotion to local Midwestern ingredients. That mentality is carried through to Kitsune, except that those same ingredients are cooked through a Japanese lens. Iliana Regan is one of the most creatively distinctive chefs in America, and Kitsune is her ode to Japan. That she has never visited the country could be seen as an insurmountable obstacle, but Regan, who grew up on an Indiana farm, taps into the flavor combinations that fascinate her, and the results (an onsen egg floating in a dashi studded with bright-red flower petals, ramen made with nettles aswirl in a basso profundo mushroom broth) are as delicious to slurp as they are lovely to Instagram. As for the service, the word that comes to mind is gentle. Kitsune’s diverse team is enthusiastic and knowledgeable without being shouty. Actually, forget Instagram—the room is so calm that you’ll probably feel inclined to shut off your phone and float away for a few hours. At Kitsune, Regan and her team’s restraint helps diners focus on what makes good ramen: deeply savory broth, chewy slurpable noodles and a few simple condiments. Regan’s milky tonkotsu broth has more body and structure than Brad Pitt’s character in “Legends of the Fall.” The split soft-boiled egg is creamy and fortifies the soup. The pork is braised in a housemade teriyaki and then sauteed to order. The result is a firm plank of pork bursting with sweet and salty notes...A doughnut glazed with Japanese whiskey icing was as soft as a cloud. In a blind taste test, this doughnut would make a Krispy Kreme seem like wet cardboard. Kitsune is Regan’s expression of what it would be like to open a restaurant if the Japanese had occupied Chicago for the last 70 years. It’s a place where virtually none of the servers and cooks are Asian, but where they’re serving technically faithful adaptations of Japanese bar snacks with overwhelmingly midwestern ingredients. Close your eyes, imagine the chairs filled with sake-swilling Kempetai and Japanese Imperial bureaucrats chopsticking bowls of donburi and ramen, and you’re there...Kitsune is another opportunity to throw yourself with abandon into an alternate dimension. As usual, Regan does not disappoint. The celebrated chef has an affinity for small, minimalist spaces given some life with personal touches. It feels cozy and quaint, with light blue walls and simple ceramic plates from Felt and Fat that make every dish look bright and vibrant. In terms of food, there are some dishes that are so good they’re mandatory. Start with the wild rice and koji porridge bread with pickles, which will remind you of just how good a baker Regan is. It’s served with a pat of butter shaped like a fox and pickles, including daikon-fermented burdock, salt-fermented purple carrot and beer-pickled eggs. A smoky and citrusy dashi with winter vegetables is filled with “tofu.” It’s made from a dairy and vegetable rillettes that feels firm when you scoop it with a spoon, only to burst in your mouth. Among the main dishes, the tonkotsu ramen was one of the most savory we’ve had, with a thick broth. It doesn’t get more DIY than Kitsune. Iliana Regan’s lovable Japanese-influenced spot makes its own tofu, miso, and soy sauce. Her kitchen, a collaboration with Justin Behlke, relies on Midwestern ingredients for its ramen, which plumbs uncharted depths of flavor with rich pork belly, a perfect soft-boiled egg, a spicy homemade chili sauce, and scallions in a thick tonkotsu broth. CHICAGO TRIBUNE, PHIL VETTEL 2017 AND PHIL VETTEL'S TOP 50, #15. The bread service is a thing of beauty; it's a wild rice and porridge bread, served as four wide, thick slices alongside pickled vegetables (no two vegetables pickled quite the same way) and a smear of house-cultured butter that, if you look closely, is shaped like a fox. Calling this bread "life changing" is probably too extreme, but not by much. The best bang-for-your-buck dish goes to the okonomiyaki, or Japanese pizza, as it’s sometimes called. Sized somewhere between a CD and a Frisbee, the custard-like pancake with bits of perky pickled ginger and squiggles of Japanese Kewpie mayo is addictive in a way few egg-based dishes are. It also has a built-in entertainment aspect courtesy of the pile of bonito flakes doing that dance they tend to do when the air hits.